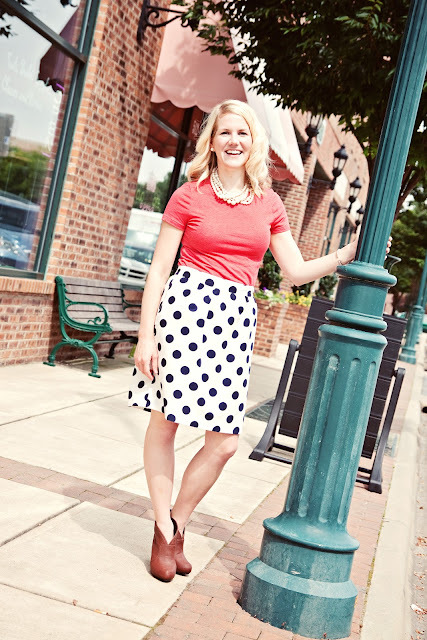 Dancing With Ashley: Polka Dots!! Have you ever been drawn to a piece of clothing? I saw this skirt in the JCrew window and the universe pulled me inside. And then the price tag took me right back out. But then, the promise of wearing it everyday for the rest of my entire life and passing it down to my childrens' wives, and their children, etc. etc, pulled me right back in. I am a firm believer that women should be in charge of their own presents; birthday, Christmas, Mother's Day, every holiday. I no longer leave it up to Noel to surprise me with a gift. I know exactly what I want, and it works out for both of us when I tell him. This skirt was my Valentine's Day present. I love it, hon!! You did such a great job! If you haven't entered the Jennie from the Blocks Giveaway, now's your chance! The winner will be announced tomorrow. I think we would get along so well (aside from the fact that we have the cutest boys in the world), Kev no longer picks out my gifts either. I never shop for myself anymore, so holidays are the perfect excuse to spend a little. I looove this skirt! I am SO glad that I'm not the only woman who feels like I should be in charge of my gifts!! For Mother's Day...I gave myself a shopping spree :) It was the best! The skirt is cute...absolutely love it! And then the price tag took me right back out..
You are just funny, just funny. oh man, Shay beat me to it. I was going to quote you as well. and I will be stealing that line. telling everyone I stole it from you, of course. This outfit is so cute I love the polka dots! Hmmm my birthday is coming soon and I must admit I like the pick out your gift idea..and P.S. those shoes are awesome!! yep, your style is absolutely adorable!!! loving those polka dots and pearls! haha thats so funny! russ would never let me pick my own presents. luckily for me he always does a good job. either way, i LOVE the skirt! Polka dots are the best! i love that you are passing items of clothing onto your children's wives. i just might have to use that one. Haha love this post!! And love your skirt! It is too fab! haha, great story... totally justifies paying too much for it :) i wouldn't have been able to leave it there either! haha I'm with ya on choosing your own gifts. That skirt is absolutely adorable! Polka dots are a winner every time. Amen and say it again!!! We sure know how to buy the most amazing gifts for ourselves!! This skirt is so worthy of the price!! It will definitely be passed onto to generations to come!! I am definitely in charge of my gifts. I'll post wishlists on my blog around Christmas, birthday and anniversary time. So, I don't directly tell the boyfriend what to get me...he just knows where to look. That skirt was a fantastic gift. You look fabulous!! That skirt is great - I'd have been drawn to it as well! yes! i understand why you were drawn to this skirt. it's beautiful on you and a great print. i'm not good with surprise gifts either - my husband usually tries to sneakily hide that he bought me what he wanted. anyhow, i also LOVE those booties. they are perfect in every way. Thanks for your sweet comment on my stripes and orange post. :) I adore the polka dot skirt and those shoes!!! We should definitely be picking out our own gifts...who knows what we would receive if not! So glad to be following your blog! Super cute skirt. You look beautiful. Okay but I really do covet your skirt. That's all. I am all for picking out my own gifts too yet at the same time I love a surprise.